Dr. Alvin Beitz, Professor and former Chair of the Veterinary and Biomedical Sciences department who is currently the Director of the Center for Educational Innovation, plans to retire next June after 36 years on the faculty. On Tuesday, November 6, he presented his final lecture to the first year veterinary students in CVM 6901, Veterinary Physiology 1, on the topic of cranial nerves. As his lecture drew to a close, students in the class gave him a lengthy standing ovation. And as he exited the lecture hall, students from his past classes lined up to recognize this notable achievement. Dr. Beitz recalls that his first lecture at the University of Minnesota was in a Veterinary Histology course during the Fall semester of 1982 on the topic of connective tissue. His many innovative contributions to graduate and professional education over the years were recognized by his induction into the University’s Academy of Distinguished Teachers in 2010. 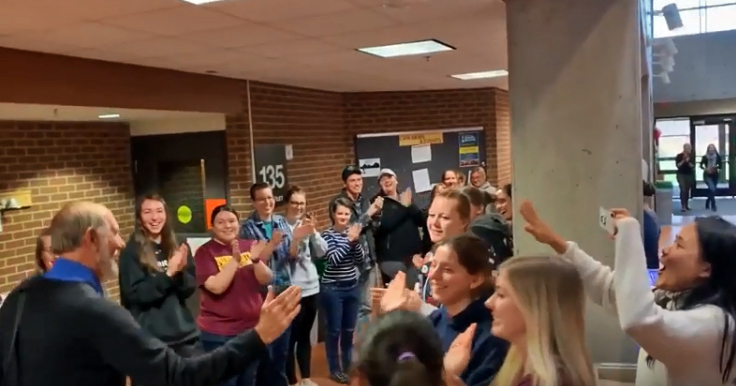 Videos of CVM 6901, Veterinary Physiology students applauding Dr. Al Beitz for his dedication and many years of teaching in the College of Veterinary Medicine.